I love this fun paper that is perfect for masculine cards. I used a simple layout for the card, using both sides of this double-sided paper. I heat embossed the happy sentiment and popped it up on foam tape. 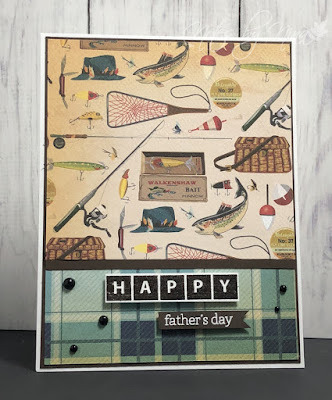 I did the same with father's day with white embossing powder then cut a small flag in one end. I added a small strip of brown cardstock and finished with some black half pearls. Supplies: White and brown cardstock, Designer Paper - Carta Bella, Papertray Ink Birthday Bash Sentiments, Hero Arts- Happy Stamp, half pearls.